An impoverished family begins to flourish after receiving a special gift--of the four-legged variety--in this uplifting picture book set in western Uganda. Beatrice longs to attend school with other village children, but instead she must tend her five younger siblings and help her mother in the fields. 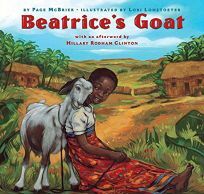 Everything starts to change, however, when Beatrice and her family receive a goat, ""a lucky gift,"" says her mother, from a charitable organization. As the months pass, the animal provides the family with sweet milk to enjoy and sell and a pair of kids that will eventually be sold as well. With the goat's bounty, the family soon has enough money to send Beatrice to school. McBrier's tale, inspired by actual events, succeeds in demonstrating the positive ripple effect of the efforts of one organization, but an afterword by Hillary Rodham Clinton sounds like an advertisement for Heifer Project (the donors of the goat). Perhaps the volume's greatest strength is Lohstoeter's (How the Leopard Got His Spots) sunny acrylic paintings, which capture the hues of dusty thatched huts and verdant banana groves of the African landscape. Sweet-faced Beatrice and her mother take center stage, wearing colorful, traditional clothes, and their bond is palpable. Ages 4-8. (Feb.) FYI: Two percent of the publisher's proceeds will be donated to Little Rock, Ark.-based Heifer Project International, a nonprofit group working to end global hunger by providing livestock and training to people in need.